Skydancer - the UK's hen harriers Calluna has disappeared! I’m very sad to have to report that one of the hen harrier’s satellite tagged as part of the LIFE project this year, has already disappeared. 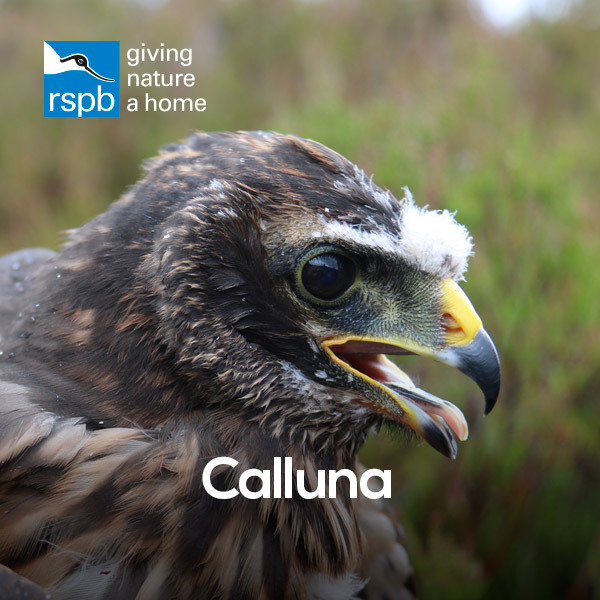 “Calluna”, a female harrier, was tagged this summer at a nest on the National Trust for Scotland’s Mar Lodge estate, near Braemar. We were monitoring her transmitter’s data which showed that she fledged from the nest in July. She left the area in early August, and gradually headed east over the Deeside moors. However, while the tag data showed it to be working perfectly, transmissions abruptly ended on 12th August, with no further data transmitted. Calluna’s last recorded position was on a grouse moor a few miles north of Ballater, in the Cairngorms National Park. For regular followers of our hen harriers, this will be a depressingly familiar story. I’m sure some will focus on the date transmissions ended – the 12th August, the traditional start of the grouse shooting season. Bluntly, the date isn’t really the point. The disappearance of one of our hen harriers is a major loss whenever it occurs. While we will likely never know for certain what happened to Calluna, it fits a pattern of disappearances where perfectly functioning tags suddenly stop transmitting and are never recovered. She joins the growing list of satellite-tagged birds of prey that have disappeared, in highly suspicious circumstances, almost exclusively in areas intensively managed for grouse shooting. The transmitters we use are incredibly reliable and the sudden halt in data being received from it, with no hint of a malfunction, is very concerning. I started working on hen harriers for the RSPB 10 years ago next month. One of the first documents I helped produce discusses how terrible it was that there were only 14 successful hen harrier nests in the whole of England that year. This year there were three. It’s appalling to me now that those historic 14 successful nests in one year would be treated like a breeding bonanza today! But despite that lack of progress and the continued disappearance of hen harriers like Calluna, I remain optimistic. More people know more about the plight of these amazing birds than ever before. In Scotland the Cabinet Secretary for the Environment has commissioned an independent group to look at how grouse moors can be managed sustainably and within the law. And there are still lots of other young hen harriers out there with satellite tags on, thanks to the LIFE project. The team has fitted a significant number this year, with the very welcome help from landowners, including the National Trust for Scotland, who value these magnificent birds breeding on their property. You will be able to follow the trials and tribulations of some of those birds very soon. Check back here for more news. These tags help us not only better understand and protect hen harrier, but also bring new voices into the fight to save them. Hopefully no more of our hen harriers go the way of Calluna. If anyone has any information about the disappearance of Calluna we urge them to contact Police Scotland as quickly as possible. I'm afraid that anyone questioning the reliability of satellite tags needs to pay attention to one fact - the location where the tracking ceased. Grouse moors relentlessly raise their ugly heads when this question is asked. The truth is that Calluna will be far from the last bird to be lost unless something drastic is done to consign the hideous world of driven grouse shooting into history.